BowieNet is nearly 20 - were you at the birth? Following the launch of www.bowieart.com the previous December, a BowieNet pre-launch site was hastily posted on the www.davidbowie.com home page in August 1998 (due to prematurely released information by EMI-Canada) and BowieNet proper was announced worldwide, 20 years ago on this very day. BowieNet was then activated fully, four days later on September 1st, 1998. Were you there at the launch? Tell us your memories of the early days of www.davidbowie.com here. Sad to report the passing of Lindsay Kemp, who died aged 80 on Friday night in the Italian port city of Livorno on the west coast of Tuscany. Bowie fans will be most familiar with the dancer, mime artist and choreographer through his work with Bowie, particularly the Ziggy Stardust presentation at London's Rainbow Theatre in 1972. Mick Rock captured rehearsal footage of Lindsay and his troupe at rehearsals and utilised it in the quite beautiful, John, I'm Only Dancing video. David had dance and mime lessons with Lindsay in Floral Street, Covent Garden, in 1967, later touring with him in Pierrot In Turquoise in the UK. The play contained a handful of Bowie originals (When I Live My Dream, Columbine, The Mirror and Threepeny Pierrot), and the performance was captured for posterity in a different 25 minute format for Scottish TV in 1970, wherein David performed When I Live My Dream up a step ladder as the character Cloud. 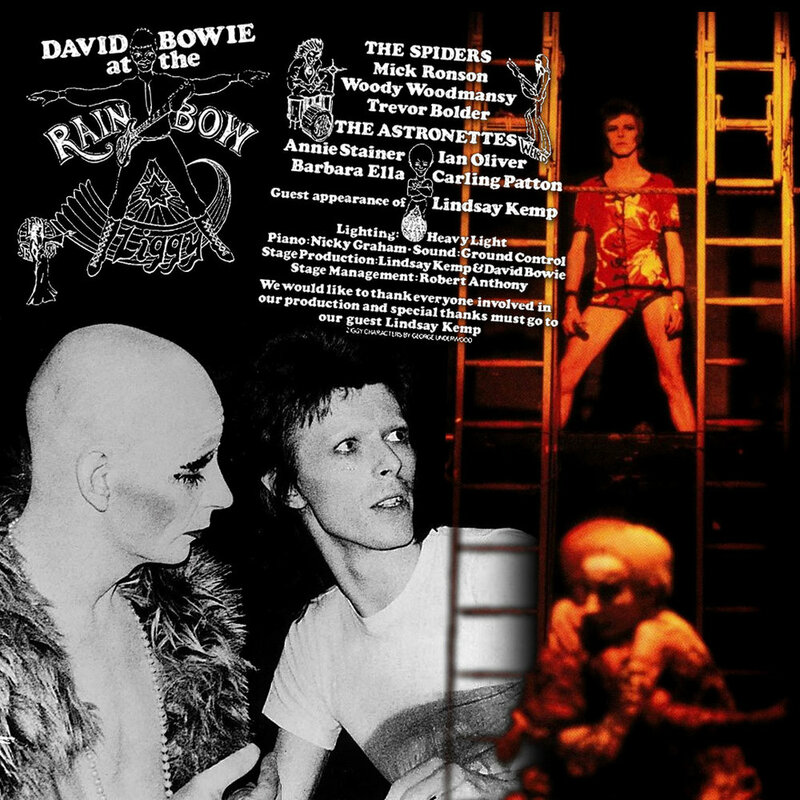 Read the full transcript of Michael Bonner’s interview with Lindsay Kemp about Bowie over at UNCUT. We’re sure you will all want to join us in wishing many happy returns of the day to Alexandria Zahra Jones on her 18th birthday. The colour picture on the left is of Lexi and her father, posted by Lexi on Fathers' Day. The image below that is of the tattoo she had done last year. The picture on the right is of the recently turned 18-year-old Manish Boy, Davie Jones, outside the BBC during a lifelong occupational hazard...a fuss being made about his hair. But that’s a whole other story. Happy Birthday Lexi, here’s wishing you love ‘n stuff from everybody here. 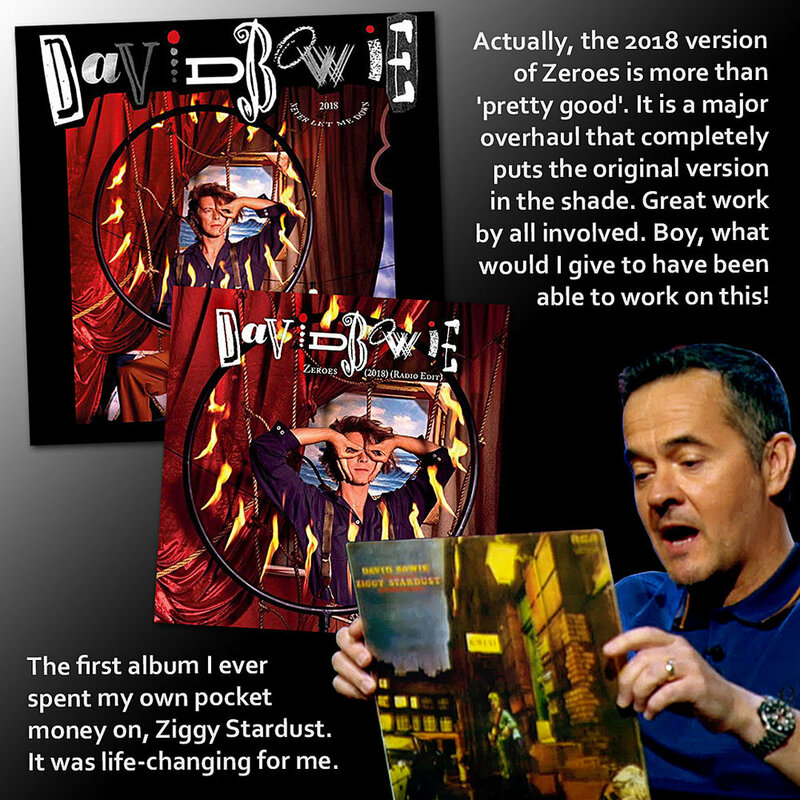 Five Years ago (pun intended) we featured top-hole record producer Stephen Street (The Smiths, Blur, Suede, Peter Doherty), when he chose Ziggy Stardust for Danny Baker’s Great Album Showdown on BBC4, back in February 2013. Explaining that the 1972 classic was the first LP he ever bought, he then went on to describe the record as life-changing: “I was captivated”. Street also pointed out that the musicians he has worked with over the years have a love of Bowie’s music in common. You can pre-order the 2018 Mario McNulty produced Zeroes/Beat Of Your Drum 7" picture disc here and read the press release here. FOOTNOTE: Today’s lyric quotation is from the song Sweet Head, a song first released as a bonus track on the 1990 Rykodisc issue of Ziggy Stardust, appropriately enough.